It’s the time of year for electoral registration. For the last couple of years, my council has offered a rather clunky web service, not designed to inspire confidence – indeed barely designed at all – but fully functional nonetheless. This year, I can register by text message – just a case of sending a ten digit number. That neatly overcomes the limitations of the web interface by not having an interface at all, but it seems to work. Less curiously but more significantly, despite the fact that my chosen response channel gives a pretty clear signal about how I like to get things done, they seemed to need to send me three sheets of paper plus a reply envelope all tucked into the original envelope just to prompt me to send my simple text message. There’s a neat trick which HMRC is rather good at: once you have demonstrated, by your behaviour, that you are willing to do things online, they simply switch to assuming that that’s how you will continue to do it in future. The user can opt to switch back, but HMRC won’t make that assumption for them. That’s an approach which others could usefully copy (and yes I know there are reasons why it wouldn’t be quite as straightforward as that for electoral registration, but there are undoubtedly ways of making things simpler). Since Public Strategist is an incorporeal creature of the ether, he has no need of genealogy, sport or fashion, so the results are quite bizarre. But it’s worth having a go, just to watch the process by which the pattern is assembled. Curiously, his real world incarnation has quite a different pattern – different, but just as spectacularly inaccurate. And of course, if you lack google uniqueness, your identity will be melded with others, some of them very long dead. So definitely more performance art than data mining. Thanks to Lance Knobel for the link. Back in the big city, life is speeding up again. I don’t have to get into a car to buy a newspaper. The nearest station is ten minutes’ walk away, not fifteen miles of twisty roads away. And my downstream speed is 5.7 Mbps, just over a hundred times faster than the 56kbps I could achieve in a Cornish village. That matters in two important ways. The first is practical. Waiting for web pages designed by people who assume universal broadband coverage is a tedious process. The web stops being a seamless flow of connections and becomes an archipelago of web pages, with very slow ferries linking them together. Worse still, some services just break, however long you wait. Google Reader simply failed to retrieve some feeds (while doing fine with others), with strange and misleading error messages, I can only assume because of things timing out before they could complete. To ensure all can access and benefit from the network of today, we confirm our intention to deliver the Universal Service Broadband Commitment at 2Mbps by 2012. This can be delivered through upgrades to the existing copper and wireless networks. We also propose public support for the network of tomorrow so that consumers in the Final Third who will not be reached by the market can enjoy next generation broadband. This will be a longer project which involves what amounts to installing a new network. Railways did not just get passengers from A to B faster than horses. The railway consolidated nations and national markets. It created new cities and city suburbs. It allowed the European powers to open up their colonies. Rail transformed the military geography of the world. For the first time, people en masse began to move away from their home towns and villages, massively enlarging the gene pool. Railways, like the internet and biotechnology today, were a genuine general purpose technology. The intriguing question is whether high-speed rail will be as transformative. My hunch is that it will. 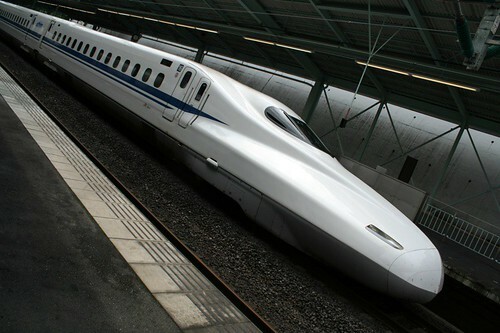 The experience of the Japanese Shinkansen high-speed network foretells what will happen – those cities that are part of the system will blossom industrially and commercially. Those outside it will wilt. That’s being used as an argument that the big cities – Birmingham, Manchester, Edinburgh, Glasgow – need high speed connection, rather than just leaving London at the edge of the European high speed network. Nobody, of course, is extending that argument to suggest a universal service. The Cornish village I was staying in will never ever have its own connection to the meatspace superhighway. So they are not ever going to get the Shinkansen benefits Hutton describes. That’s part of a trade off which some people make willingly and deliberately and other people have forced upon them. There are wonderful advantages to rural life, but density of service provision is not among them. That’s been increasingly – if reluctantly – recognised and accepted: shops, schools, pubs and post offices have all retreated. And although the Tate may be in St Ives, the sheer range of culture and connections available to me in London cannot readily be duplicated without the population density to support them. So it’s important to ask the question of why broadband access should go against that trend, why there should be a universal service obligation for the internet which isn’t seen to apply in the same way to other consequences of a dispersed population with consequent high costs to serve. One answer is that digital universality is in quite a few ways the answer to the absence of other forms of universality: mail-order shopping, the global newsstand, university, gallery and concert hall and government office can all come down a very thin wire, with plenty of space left over for gossip, chatter and games, to say nothing of all the things which haven’t been invented yet. Until very recently you needed a medium sized town for any of those and a decent sized city to have any hope of all of them. A more pragmatic answer, of course, is that universal broadband is feasible in a way in which universal bullet trains are not. But perhaps the most interesting answer is that the question does not seem to arise: I have seen nobody argue that universal broadband access is a bad thing or that it is wrong to be contemplating some form of cross-subsidy to correct it. That is an interesting indicator of a level of recognition and acceptance that internet has gone far beyond being a frivolous luxury. That still leaves one last issue: if there is a class of people without access to the internet for whom the costs should be subsidised, is the rural/urban split the right one to be using in the first place? The Joseph Rowntree Foundation’s poverty site gives some clues, including the chart below showing a significantly higher proportion of poorer people in urban areas than rural. Even accepting the argument that it is reasonable to subsidise the ‘final third’ because of the high cost and consequent absence of commercial solutions, that still leaves open the question of where the money comes from. On the face of it, there is a risk that the Digital Britain Next Generation Fund may be regressive in its approach to collecting money. Whether it actually is or not will be more complicated to work out: the very poorest won’t have a fixed phone line to be taxed in the first place, the ‘final third’ population may or may not be representative of the rural population as a whole, and so on. And a final irony. There are still plenty of places in Cornwall where it is impossible to get the most basic mobile phone signal, let alone anything more fancy. One of them, miles from anywhere, down a steep hill, in a narrow valley at the end of the road was once the most connected place in the world.